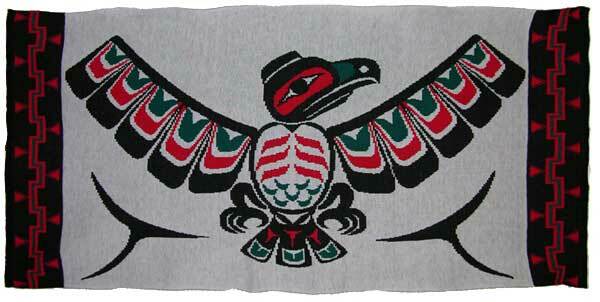 This Blanket is designed to honor the Eagle with Spreading Wings of the Pacific Northwest Coast. Common features which are used in the "Eagle with Spreading Wings" are the black formline which defines all the Eagle parts. Inner designs of the head use the U Shape for the Ears and Ovoid for the eye orbit. Wings are variations of U Shapes angled out to form the magnificent Spreading Wings. The Oval Body is accented with S shapes to represent the ribs and crescents to represent feathers. The Foot consists of Four claws. U Shapes are frequently used on birds to depict the shape of feathers. The U Shaped tail Feathers have accents of trigon shapes. Two Large Trigons accent the spreading wings in flight. The edges of the blanket are bordered by a Geometric Basketry Design. Submitted by melodynorth on Mon, 11/30/2015 - 15:59.